You mean who want to switch from PS4 to Xbox One S ? £5 more at Currys and you get Doom and 3 months Xbox Live. Best deal for those who don't want to spend £300 on a Nintendo? If you are happy to sell to CEX/ebay you can sell the physical copies of Forza 7 (£16) and Wolfenstein 2 (£18) for £34, making the Rocket League bundle £146 on its own. 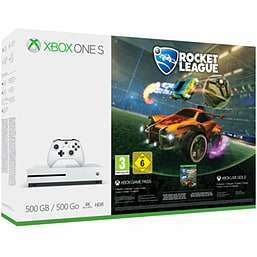 Alternatively from Tesco: Xbox One S 500GB + Rocket League + Forza 7 + …Alternatively from Tesco: Xbox One S 500GB + Rocket League + Forza 7 + Wolfenstein 2 £180 @ Tesco Direct (with 3 months XBox Live)If you are happy to sell to CEX/ebay you can sell the physical copies of Forza 7 (£16) and Wolfenstein 2 (£18) for £34, making the Rocket League bundle £146 on its own. It's expired then Come back next sales.